Do 3d printed PLA parts really biodegrade? Photos after 1 year inside a fish tank filter. Several of my recent design projects have required properly-fitting o-rings, and yet as I looked around the web, I was frustrated at my inability to find a good practical explanation of their use. Which size o-rings fit with which size pipes? Which pipe sizes nest closely? 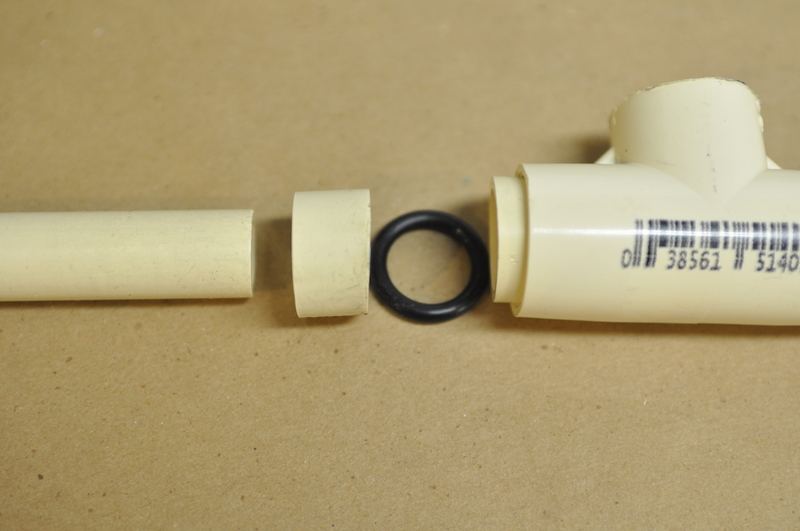 After much experimenting with various PVC fittings, copper fittings, and o-rings of all assortments, I have a few answers that I outline here my own mini-guide to the use of O-rings in PVC/CPVC projects. Any discussion of O-rings needs to start with a discussion about pipe diameter. In the United States, pipe and tubing is generally specified as a “nominal” size in imperial units, for example 1/2″ copper tubing or 3/4″ PVC pipe. In much the same way that “two by four” lumber doesn’t actually measure 2 inches by 4 inches, a 1/2″ pipe has neither an inner nor outer diameter of 1/2″. Nominal 1/2″ copper pipe has an ACTUAL outer diameter of 0.875 inches. Pipe sizes are specified in terms of their nominal outside diameter, also known as “OD”. The OD of 1/2″ PVC pipe from any manufacturer will always be within a fraction of a millimeter of the defined standard for PVC pipe. Of course, since the outside diameter of a pipe mates up with the inside diameter (“ID”) of a fitting like a coupler or a tee, the ID of a 1/2″ fitting from any manufacturer will also be effectively constant. Design Rule 1 for O-rings: Any measurement that requires a close tolerance should be made relative to the OUTSIDE diameter of a pipe, or the INSIDE diameter of a fitting. The wall thickness and inside diameter of pipes is generally NOT specified. Due to the properties of the material, wall thickness generally falls in a narrow range, but it is very common to see differences between pipe made by different manufacturers, and even across lots from the same manufacturer. 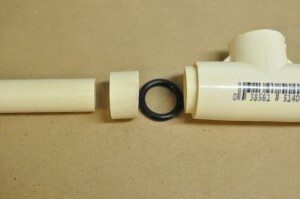 Similarly, the wall thickness of a fitting like a coupler or tee is not specified, and varies widely from part to part. As if nominal vs actual measurements weren’t bad enough, the ACTUAL diameter of 1/2″ copper tubing is NOT the same as 1/2″ PVC. See the table below for a listing of common pipe materials and their associated sizing specs. One saving grace: The guys who set the specs for pipe threads seemed to have their act together, so 1/2″ threads are 1/2″ threads, whether you are talking copper, PVC, CPVC, etc. O-rings specs are generally sized based on “nominal” inner diameter, outer diameter, and cross-section. This “nominal” measurement should not be confused with “nominal” pipe size. A “nominal” 5/8″ ID O-ring has an ID of just about 5/8″, plus or minus the manufacturing tolerance. Many common O-ring sizes have a sort of shorthand name, colloquially called a “dash” number. For example, a “-212” (“dash two twelve”) O-ring has an ID of 5/8″, a cross section of 1/8″, and therefore an OD of 7/8″. Note: It supports my O-ring habit when you buy through the links above. 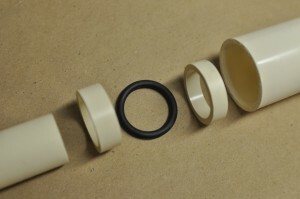 By happy circumstance, 1/2″ CTS CPVC fits neatly inside 3/4″ CPVC, and a -208 O-ring is perfectly matches the OD of each. By happy circumstance, 3/4″ CTS CPVC fits neatly inside 1″ CPVC, and a -212 O-ring is perfectly matches the OD of each. What type of o-ring do you use for CPVC? Do you need a special type of o-ring?